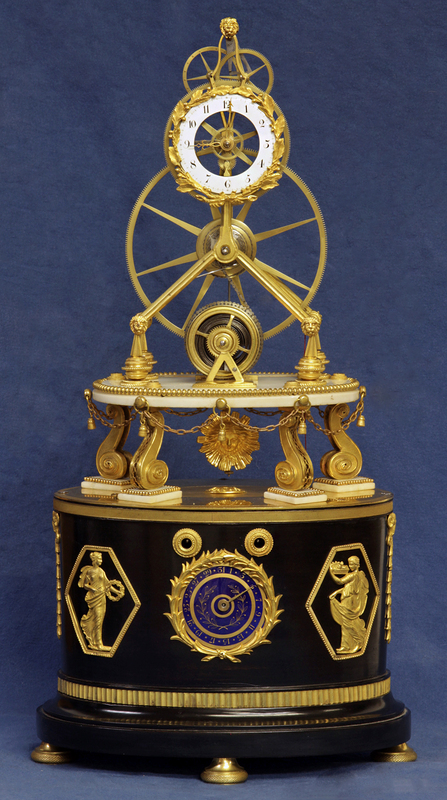 c.1800 French Quarter Chiming Marble, Ormolu and Ebonized Skeleton Clock. 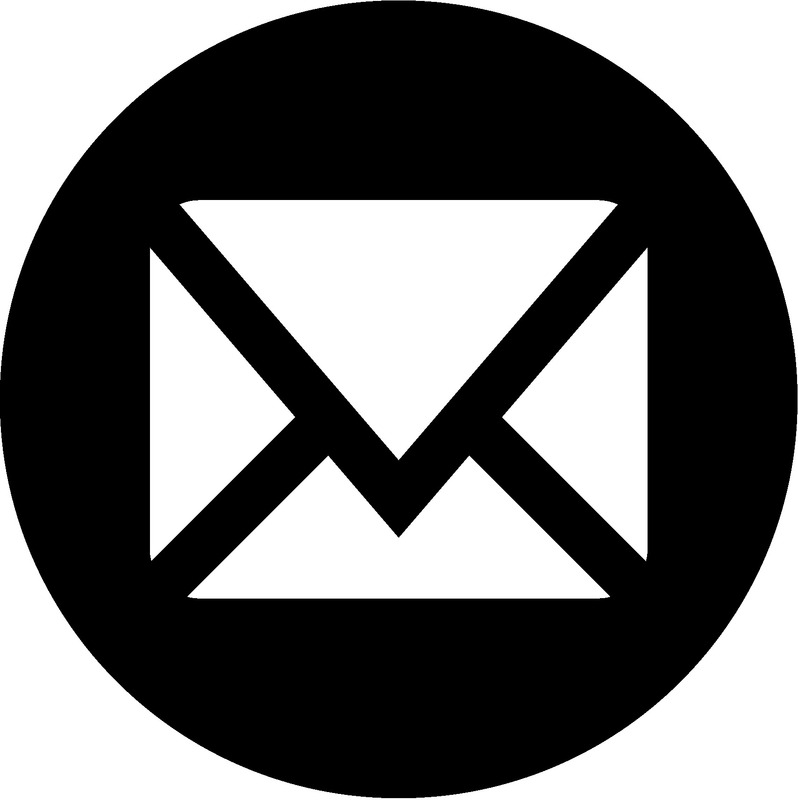 Musical Movement – Thwaites, 2089. 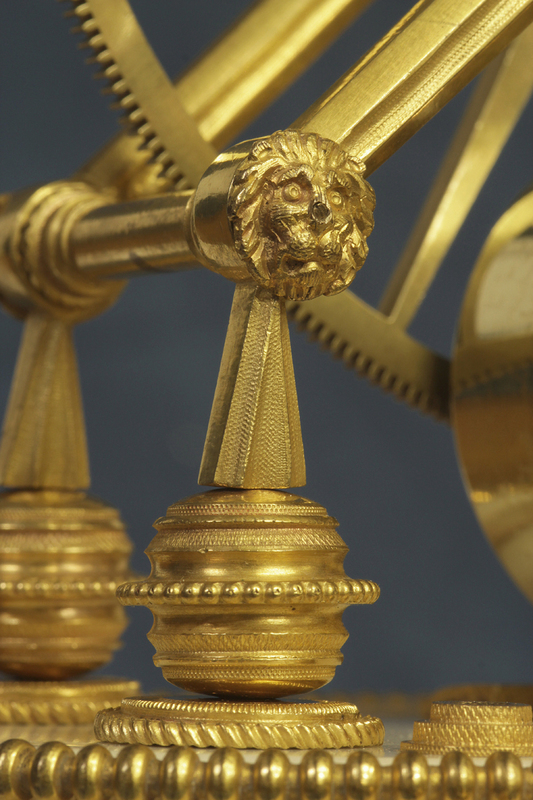 The beautifully designed and executed three tiered case has cast inverted-y ormolu frames for the movement, multi-piece shaped and beaded uprights and four finely cast volutes that are sandwiched between shaped white marble pieces with beaded edges. 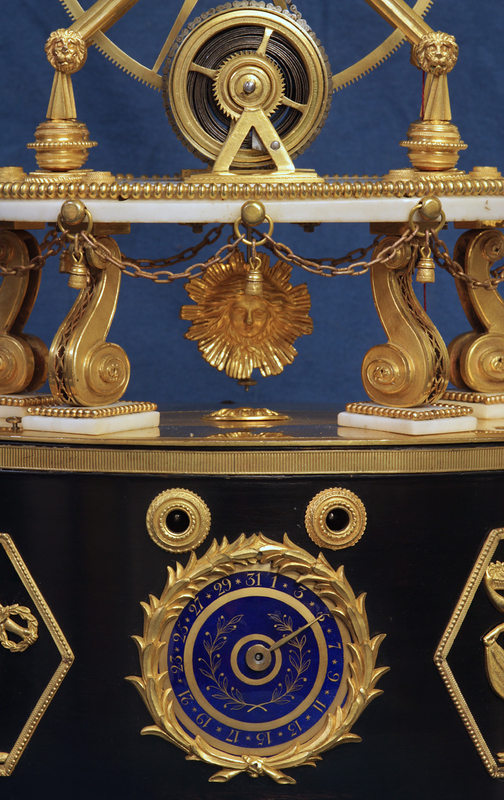 The whole stands on an oval ebonized base with ormolu appliqués, decorative feet and a date dial. The white porcelain chapter ring time dial has Arabic numbers for the hours, finely finished ormolu hands and an oak leaf bezel. The blue porcelain date dial has gilt Arabic numbers, 1-31, concentric circles and an acanthus leaf bezel. 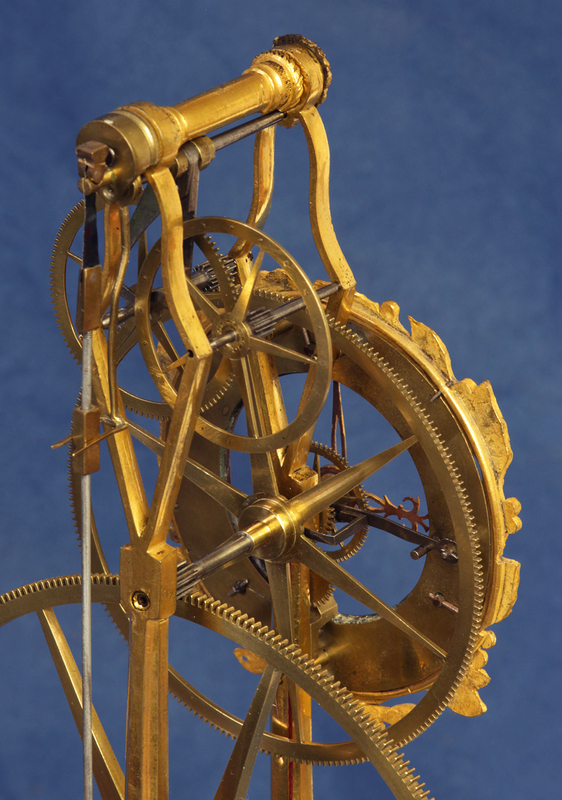 The eight-day time and strike movement has a chain fusee, decorative ormolu screw caps for the posts, the going barrel incorporating a fretted cap mounted to the marble below, an eight spoke great wheel, a pinwheel escapement with elongated calipers and a pendulum with a sunburst bob suspended by a steel spring. The strike trains are activated by a string that is guided by pulleys and travels along the backside of the frame. 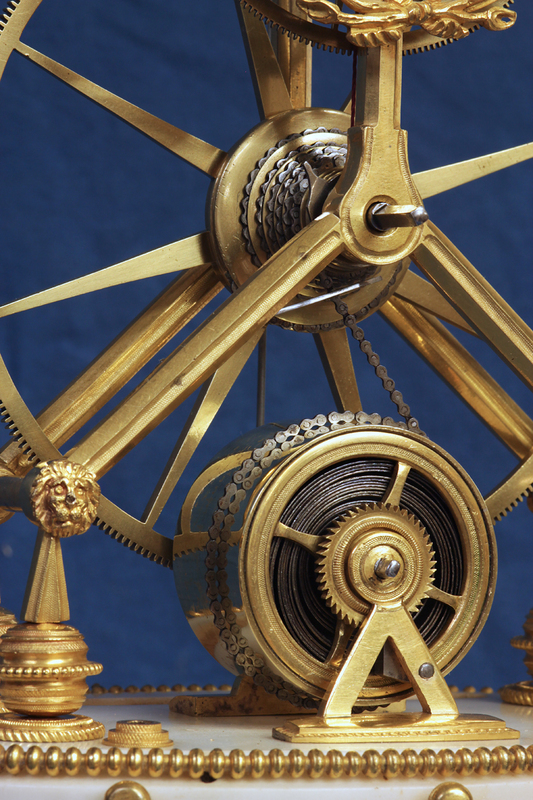 Mounted to the underside of the clock base and concealed within the ebonized base is the large double fusee striking movement. 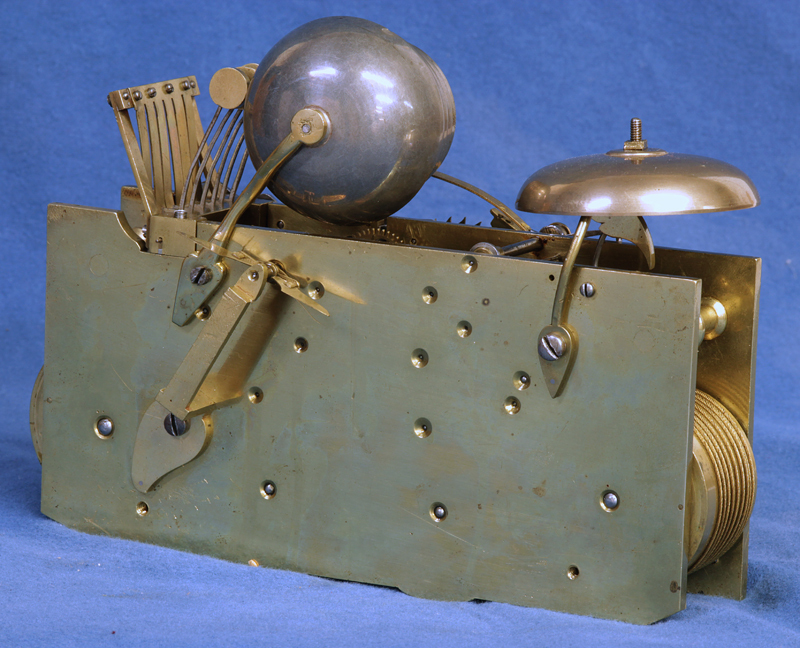 It strikes the quarters on a nest of 6 bells with 6 hammers, strikes the hours on a large bell, is stamped ‘Thwaites, 2089’, is wound out the front, carries the steel date hand that is advanced by the strike train and has a vertically mounted plunger that advances the strike for resynchronization. 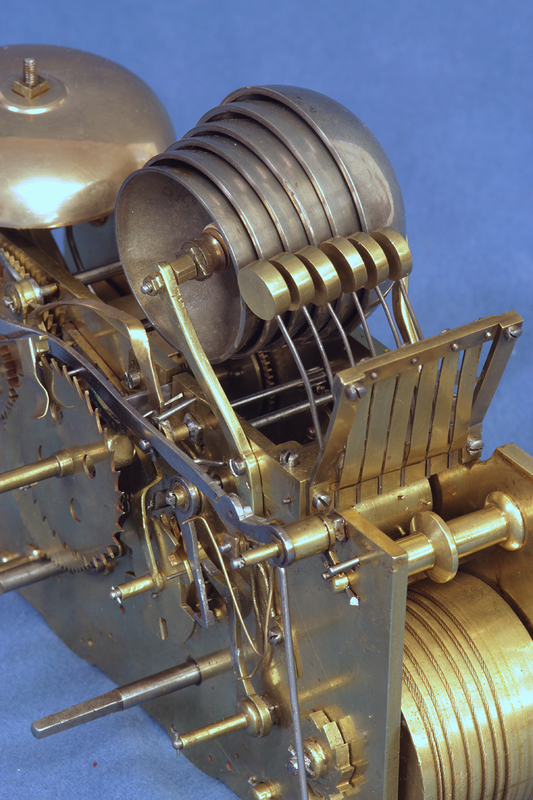 There were a small amount of this wonderfully delicate variation of skeleton clock made around 1800. Some were just the clock and others incorporated a base that housed the quarter and hour strike trains. 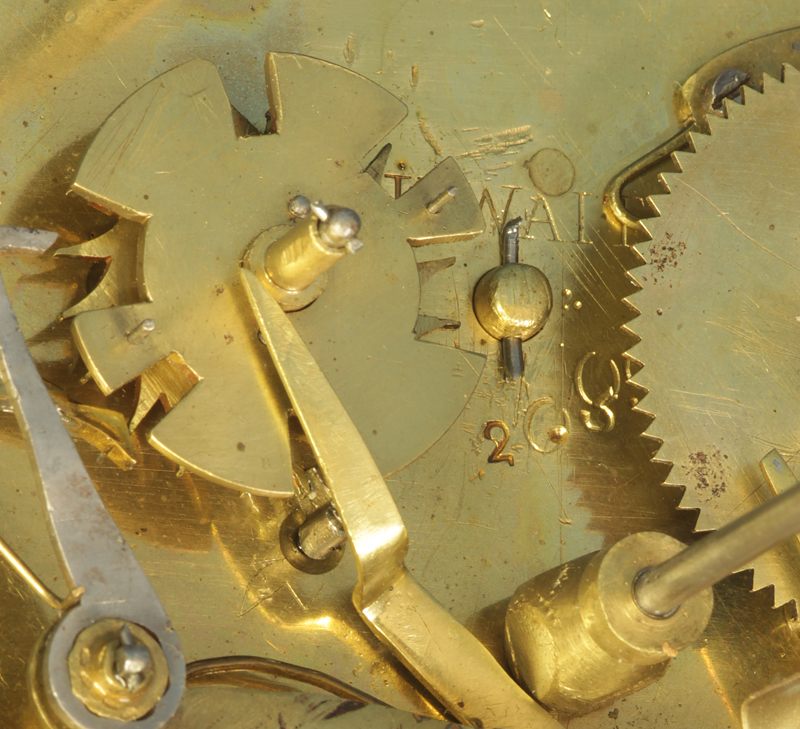 ‘Continental and American Skeleton Clocks’, by Roberts, pgs. 77-78. 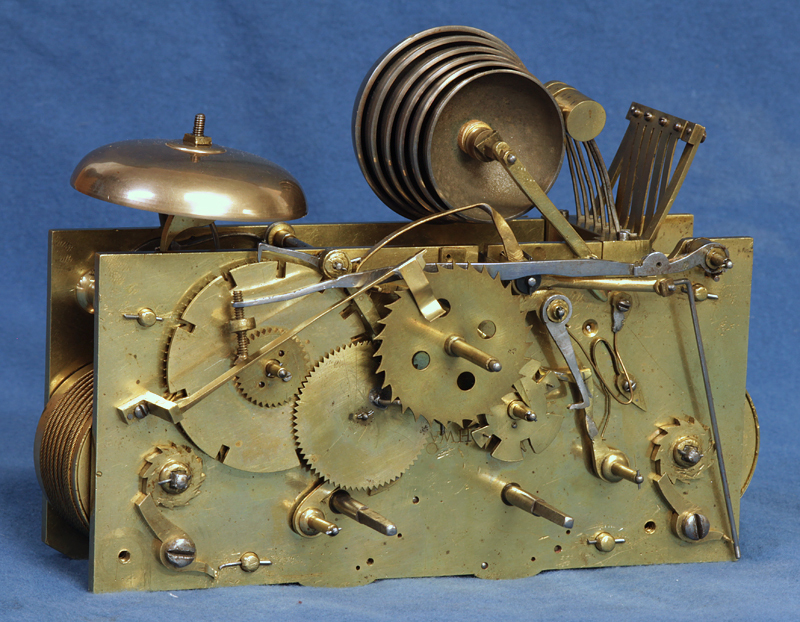 ‘Skeleton Clocks’ by F B Royer-Collard, pg.64. 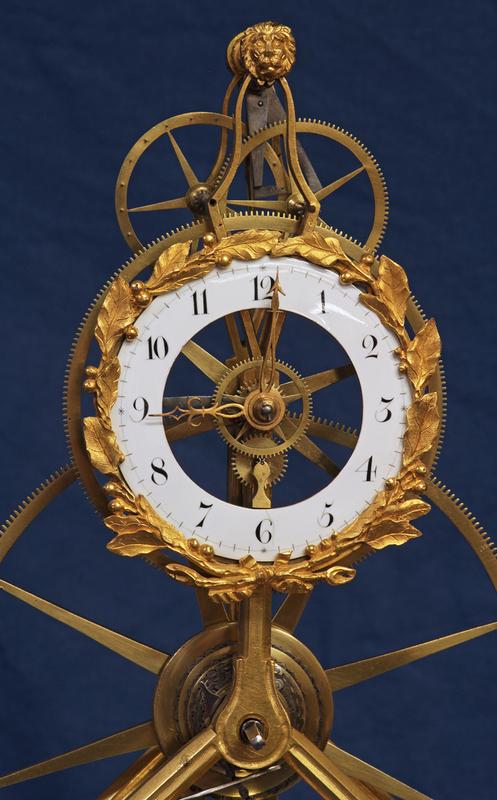 ‘Continental and American Skeleton Clocks’ by Roberts, pg.68. 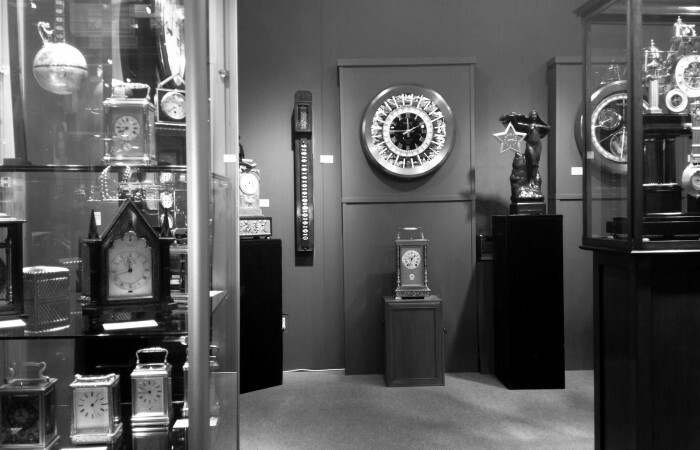 The Thwaites family of clockmakers had a long history dating back to the beginning of the 17th century. 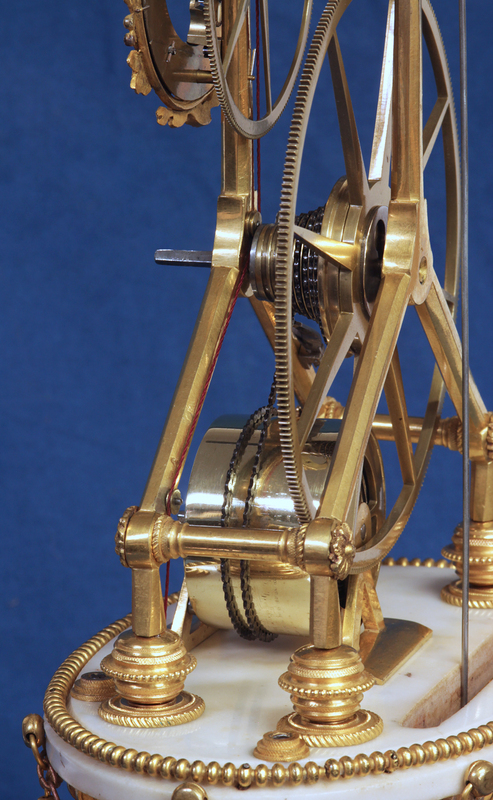 John Thwaites was head of the firm from 1780 to 1816, a master of the Clockmakers’ Company in 1815, 1819, and 1820, provided fine quality clock and musical movements to the domestic and export trade and partnered with George Reed beginning in 1816. According to the available Thwaites’ records the number stamped on the strike movement, 2089, shows it was made about 1799.